Forthglade Just Lamb is a wholesome, highly nutritious complementary pet food for your adult dog or puppy from 3 months old. A wheat gluten, soya, dairy, egg, and additive free dog food, Just Lamb can be fed with a good quality mixer, allowing you to feed your four legged friend on an completely natural diet. 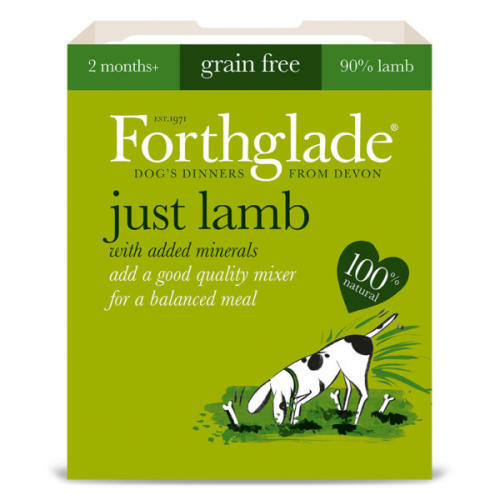 Made with fresh, natural lamb and as high a proportion of locally sourced ingredients as possible, gently steamed and vacuum-sealed to lock in the delicious goodness, so you can be confident your four legged friend is receiving the very best for every meal. Lamb (60%), Chicken (28%), Minerals. Protein 11%, Oil 6%, Fibre 0.5%, Ash 4%, Moisture 79%.